Cabinet card the size of a carte de visite (a bit more than 2.5 x 4 inches). This one came in a bunch I bought on eBay that were advertised as pictures of men with great mustaches, or something like that. I thought it would be fun. (I was right.) They turned out to mostly be from around the turn of the last century, give or take a decade or so, and mostly from the old Austro-Hungarian Empire (which, of course, covers an enormous area, though in the case of my photos tends to focus on Vienna and Budapest, despite plenty of exceptions). So this one is a head-scratcher. 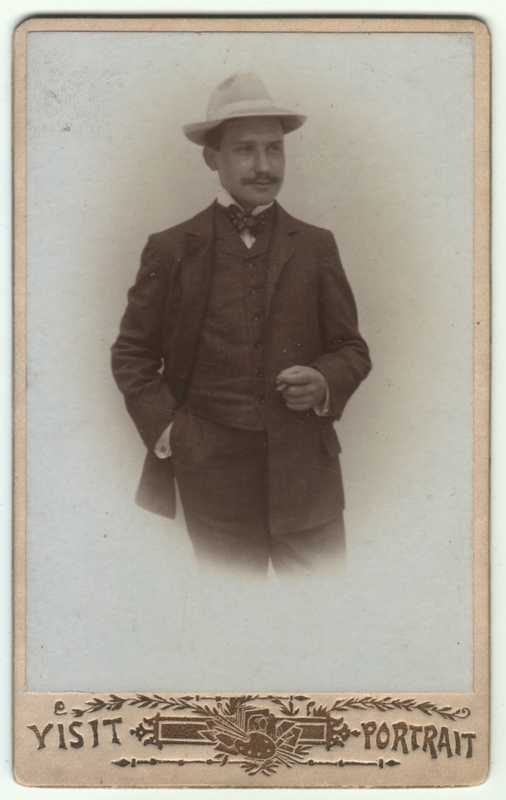 It matches some of the others I bought with it, both in the style of the man pictured, and in the overall way it was put together, as a cabinet card the size of a CDV, with the gilt lettering and the slightly blue image. But it says “Visit Portrait”! (The back has a typically romantic design of flowers and cherubs with the word “Souvenir”, which can be English or French). “Visit portrait” is one possible translation of “carte de visite”. Is that what the words are referring to? Or is it some sort of actual souvenir card? If so, why in English? Are they catering to visiting Brits? Is English somehow considered romantic or chic on this card? Or perhaps this is actually a photo from England? But if so, why the awkward wording, as if a clunky translation? Why no photographer’s name anywhere? I don’t think I have any others like it, but surely it’s not unique in the world, so perhaps somebody will recognize it and be able to shed some light on it. Meanwhile, there’s this jaunty fellow to stare at and enjoy. He is a dapper looking gentleman who seems quite relaxed and comfortable in his own skin. He also looks like a hustler of sorts, someone who has a card game later in the evening. I like him. I would hang out with him, and drink whiskey. A cool dude. Yes I can see him as a hustler too! And once again my crack team of investigative researchers has swung into action to save me from my own laziness. I don’t know why I didn’t think to actually Google “visit portrait”. Great article, Paul, thanks for finding it!